As many have already noted across the Web, there are many things not to love about the iPad: the premium pricing, lack of an upgrade path, no flash…and the list goes on and on. Surprisingly, all these perceived flaws actually make the iPad become a better platform for reading. The two keys to this are the one big button — the inability to multitask — and the lack of support for Flash video. Without the ability to instantaneously surf away from the text, it actually ends up promoting the idea of using the device to read and to focus concentration on the text. This, paradoxically, is not something publishers might want to hear at the moment. In pursuit of justification to charge a higher price for e-books than, say, $9.99 — perhaps even as much for an e-book as a hardcover — there has been much discussion of possibility of producing “enhanced” e-books. These titles would presumably be loaded with supplemental multimedia materials to justify the higher price. This was one of the reasons why some suggested a video-capable, full color Apple tablet might save the book business. Of course, this not what readers necessarily want; what they really desire are better, more compelling books. Romance novels are enticing to fans — the vast majority of whom are women — exactly because they are textual, visualized in the imagination and not on a screen. To put it another way, it is unlikely that one’s understanding or appreciation of James Joyce’s Ulysses would be enhanced in any way by coming to the end of the text only to find a video of a masturbating Molly Bloom. There’s an argument to be made that the vast majority of readers just want the book itself. Almost any “extra” a publisher could provide is likely available for free on the Web, or should be. The only “extra” that should be amended to an e-book is the first chapter of the author’s next book and/or samples of their backlist. Keeping it simple is the key. Apple is, if anything, the master of keeping it simple and, very often, attractive. And this is, I believe, one of the reasons that the launch of iBooks should give pause to many publishers. Now that Apple is in the “book space” with its own branded retailer, it’s only a short leap before they become publishers themselves. Just look at what Amazon has done since the launch of its Kindle, with the company launching a variety of publishing and self-publishing initiatives under their umbrella. In fact, on Tuesday, Amazon announced the first four original manuscripts to be published under it publishing imprint, AmazonEncore program; all discovered through its own Amazon Breakthrough Novel Award contest. I would argue that Apple is in an equally strong position to become a publisher. Apple’s iPhoto software already offer users the opportunity to create photo albums based on templates which can then be easily converted into attractive bound books. It would take only a little effort for Apple to add similar functionality to its iWork software and to allow users to easily convert a document and images into an e-book, which could then be instantly uploaded to iBooks for sale. With Apple’s enormous and enthusiastic base of users, many of whom were introduced to the company via its now ubiquitous iPhone (it’s only a matter of time before Apple’s reader software is rolled out across all devices), the company could quickly become a leader in e-book publishing. The biggest obstacle to this may be Apple’s reticence about opening up its own sales platforms to the public. Think of both iTunes and the App store, which is open to the public, but heavily policed by Apple’s own people. 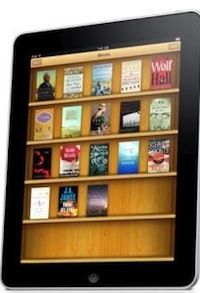 Were the company to open the iBook store to those who wanted to self-publish, they would have to show a willingness, much like Amazon has, to work with authors directly. If they can do this — perhaps by offering users the opportunity to create their own branded stores, under public or even private accounts — they won’t have to worry about the quality of the content. Their role would be as a retailer/distributor who merely takes a percentage of the sales, in much the same way Apple is doing with Penguin, HarperCollins, et al., under it’s much discussed “agency model.” Unlike opening up iTunes to the public, which considering the size of the typical song file would have taken a huge investment in storage, opening iBooks to the public should be relatively inexpensive by comparison. I believe such a strategy, if done to Apple’s generally high standards, could potentially win Apple a sizable chunk of the self-publishing market in a relatively short period of time. Can you just imagine the satisfaction of turning on your iPad, opening a file, and pressing that one big button to “publish” your new e-book. The lure would be hard to resist. The only obstacle I can see is finding a suitable name. iPublish was the name Time Warner Books’ failed e-publishing program from 2001. Apple might want to find something with better karma.